Some was sprinkled around the base of a tree. More was scattered over the floor of the tram garage. But it was just outside one of the veterinary clinics, under a wide overhanging awning, that Michelle Tirhi got really excited. Bending down, she picked up a tiny black sliver the size and shape of a rice grain and held it up triumphantly. Or guano, to be precise. 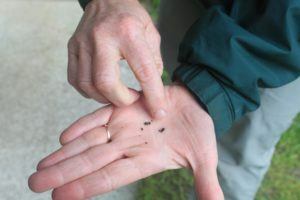 Tirhi, the District II wildlife biologist for the Washington Department of Fish and Wildlife (WDFW), was on the last stop of a tour around Northwest Trek to find fresh bat guano, accompanied by Trek conservation engagement staff Karen Povey and Rachael Mueller. Why bat poop? Because white-nose syndrome has hit Washington bats, and WDFW wants to study it. A Washington little brown bat. White-nose syndrome is a disease that has spread quickly in eastern North America over the last decade, killing over six million bats and wiping out entire colonies. A fungus that grows on the noses, wings and ears of bats during winter hibernation, it gets its name from the white, fuzzy appearance it may give the suffering animals. Invading deep skin tissues, it irritates the bats as they hibernate, which burns through the fat reserves they need to survive. And now it’s here in Western Washington. After the first diseased bat was found by hikers near North Bend in March 2016 the department acted quickly, spreading out around the site to study local bat colonies for signs of the fungus. But it’s tricky to spot. Washington bats are difficult to find during winter – when the disease spreads – as no-one quite knows where they hibernate. By summer, the fungus spores have died off from the heat. So Tirhi swings into gear in spring, partnering with bat-populated sites around Pierce and Thurston counties to catch the tiny winged animals as they return to their summer roosts. And to spot the fungus? Well, that’s where the guano comes in. Washington bats can fit into the tiniest of crevices to roost. They love places high up, relatively undisturbed, and preferably south-facing to capture heat. An extra section of roof gave them the perfect spot – and Tirhi the perfect ledge, high up and away from visitors, to attach a meshed tray to collect droppings for the lab. But before setting up the tray, she drove around with Mueller and Povey to the garage where the trams that take visitors around the Free-Roaming Area are parked at night – and discovered a treasure trove of guano. And when Muelller, who counts the bats with volunteers, estimated the garage to be home to around 90 bats, with the same number in the breezeway, Tirhi was visibly thrilled. 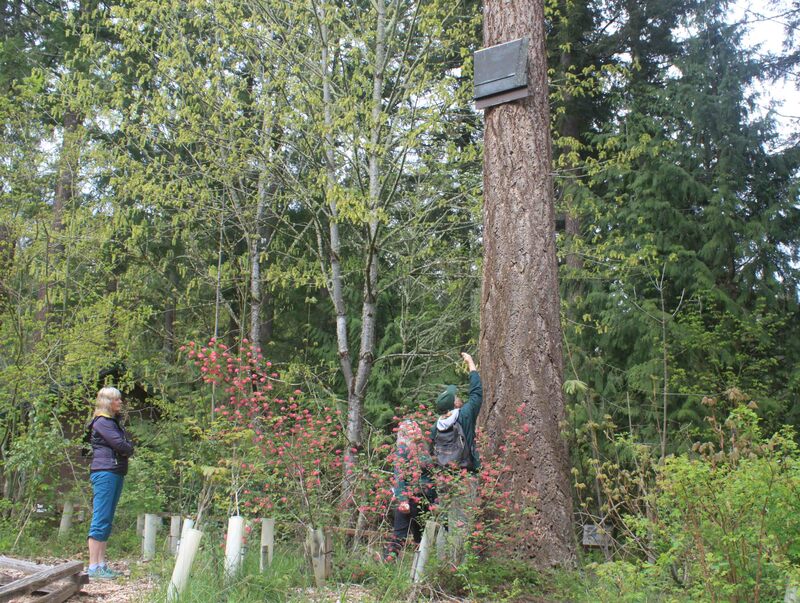 Northwest Trek conservation engagement staff Karen Povey (left) and Rachael Mueller show WDFW biologist Michelle Tirhi (right) a bat box in a tree near the picnic area. In coming weeks they’ll attach a tray around the base to collect guano from roosting bats. Bats might be tiny, and they might mess up a garage. But they’re essential to ecosystems around the world. They consume insects that would otherwise damage valuable crops and forests or threaten human health. And some are pollinators, helping grow our food and disperse seeds. So far, nobody has found a cure for white-nose syndrome, or even a way to prevent it from spreading, other than ensuring humans (or pets) don’t inadvertently carry the fungus on clothing from infected caves and mines. That’s why scientists like Tirhi are enlisting help to collect guano, send it to a lab for testing and study the disease and, if possible, stop the spread before it devastates Western bats too. Michelle Tirhi shows the shininess of bat guano. But Mueller wasn’t done yet. Driving Tirhi around to the veterinary clinic area, she led the way to a small building where the vet technicians were having to sweep bat guano every other day. Sure enough, there were the little black pellets – and overhead, the chirruping, high-pitched sound of slightly annoyed bats. “Wonderful!” said Tirhi, picking up a pellet. “They look like mouse poop,” observed Mueller. And sure enough, as she turned the little pellet to the sunlight, it glittered. To some, just bat poop. But to biologists, a kind of gold treasure that would, maybe, yield the secret of saving our bats. 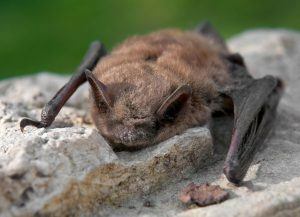 NOTE: If you ever see sick or dead bats, please report them to the Washington Department of Fish and Wildlife at 360-902-2515 or wdfw.wa.gov/bats. Never handle a live bat with your bare hands. White-nose syndrome does not pose a threat to humans, pets or other animals.